LoRan Needle Threader  - $1.90 : Yarn Tree, Your wholesale source for cross stitch supplies. Item 7876. 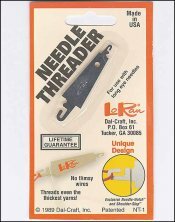 LoRan Needle Threader. Popular needle threader available carded or bulk. Threads even thick threads or yarns in long eye needles. From LoRan.